As Christian parents, I’m afraid we have been slowly outsourcing our roles as our children’s primary influence. We now delegate them to the schools, the child psychologists, and yes, even to the church. For all the hours spent in Sunday school and youth groups growing up, how much understanding of the Christian faith do kids really have by the time they reach their late teens? A 2006 study by The Barna Group revealed troubling statistics that 70-75% of Christian youth leave the Church after high school. That translates to roughly 6 out of 10 twenty-somethings that have failed to translate high levels of church involvement into active spirituality during their early adulthood. Being connected to a local body of believers is incredibly important, don’t get me wrong. A flourishing church community that provides discipleship to young people can be very helpful, especially as kids become teenagers and may begin questioning some of their parents’ beliefs. But passing on faith from one generation to another is primarily a parental effort, secondly a community effort (Deuteronomy 6:6-9). Let’s be honest- how many of us expect Sunday school teachers and youth pastors to train our kids spiritually, while neglecting to teach our own children at home during the week? And how many of us just assume that they are actually being taught sound doctrine during that 1-2 hours each Sunday? The stark reality is that many kids who grow up in church don’t leave home with much more understanding of Christianity than could be taught in a week of youth camp. One problem is that they learn random, individual stories in the Bible, but there is little to no emphasis on how they all fit together as part of one big picture. Think about it. In our typical Sunday school teaching style we pull out pieces of the Bible to highlight for kids, usually accompanied by a craft or other activity. But several years later, can they explain what Noah’s Ark, Joseph’s Coat of Many Colors, the Parting of the Red Sea, and David & Goliath have to do with Jesus, and why these are relevant to their faith today? Fixed Point Foundation, in their nationwide survey of Secular Student Alliance members, found that this lack of connected understanding was one of the most significant reasons that college-age atheists had left Christianity. They heard plenty of messages encouraging social justice, community involvement, and being good, but they seldom saw the relationship between that message, Jesus Christ, and the Bible. During their years of attendance in Sunday school, as teachers and curricula change, kids are basically handed various parts of the Christianity puzzle one piece at a time. In addition to Bible stories taken out of context and chronological order, kids get a little help with building godly character and some basic life lessons. Unless there is a consistent and focused spiritual trainer in their life like say, a parent, those pieces will almost certainly stay unconnected. The unintended message we send to children is that Jesus is just another story in the Bible. What’s worse, in some cases He can even be extracted from it and suspended as an individual piece. Kids grow up and leave home without fully understanding their need for utter dependence on Him, because they’ve heard so many trivial meanings of unconnected passages like “God is with you when you’re scared” or “God will always take care of you”. 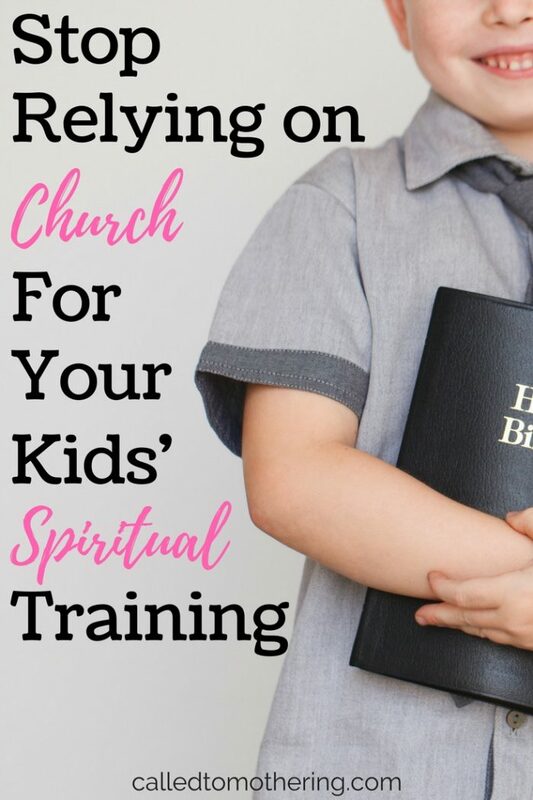 If this is essentially the extent of a child’s spiritual training, we’ve got a big problem. The point is to not just make believers, but mature believers. What’s missing from traditional Sunday School is how children can and should take ownership of their sins. The life lessons they’re taught from biblical characters, while important, are emphasized over their need for a Savior and instruction in why the Bible is reliable and true. To stand strong in a secular world, kids need a level of spiritual depth that simply isn’t found here. What can the theistic Sunday-school meeting for an hour once a week, and teaching only a fraction of the children, do to stem the tide of a five-day program of humanistic teaching? To get as much instruction from church as they do from school, a child would have to attend two hours a week for 140 years! The church exists to support parents in their role as the primary spiritual influence over their kids, not to assume this role for them. God holds mothers and fathers accountable first and foremost for the spiritual training of the children He has entrusted them with. It is our job as parents to bring our children up “in the discipline and instruction of the Lord” (Ephesians 6:4). This doesn’t mean that we merely teach theology or apologetics, though. How we live inside the home and out in the community needs to reflect Christ as well. We should demonstrate to our kids what it looks like to truly be a follower of Jesus by modeling grace, servanthood, forgiveness, and unconditional love to family members and neighbors. In Family Driven Faith, Voddie Baucham Jr. writes that the retention rate of kids who stay in the church is not highest among those in youth groups; it is highest among those whose parents (particularly fathers) actually disciple them. Living out genuine faith, combined with discipleship, will help our children build the kind of foundation they need to stand strong through real challenges. If we’ve given them only a paper boat faith, the first wave of life will sink it.